Aphids, scale insects and other pests are a threat to any farm or garden and pose an even greater problem for organic gardeners because the chemicals available for use in organic production tend to be milder than or not as potent as their synthetic counterparts. For years, the most common answer to this threat has been the use of poisons, which can create problems in the soil and the produce we eventually eat. Even the healthiest plant, with its natural defenses, still needs help fending off pests. Migrating insects and other nuisances are usually attracted to sick, malnourished foliage and fruit that give off different colors and heat signals than healthy plants. Therefore, the first line of defense is to provide plants with as much available nutrition as possible. Most people know that organic plants tend to have higher nutrient values than plants grown with synthetic programs. Regardless of how nutrient dense the soil is,, there are other factors that will result in some type of pest problem. Below are some natural and organic pesticides you can use that are safe for you and your family. “Insecticidal soap” may sound as toxic as the chemical pesticides you see in the store, but it is so safe that you use it in your kitchen every day. Common dish soap has been used as a natural pesticide for longer than most chemical pesticides have existed. It is inexpensive, virtually non-toxic to birds and other animals and leaves no harsh residue. Simply add two tablespoons of unscented dish soap to a gallon of warm water and spray it on your plants in the evening; if you live in a warm, sunny climate, spray the plants in the morning with water to remove excess residue. The soap interferes with the cell walls of soft-bodied insects, suffocating them shortly after contact, and also destroys the thin walls of their eggs. Often the best weapons against harmful insects are other insects that have evolved to prey on them. These predators are inexpensive and readily available from biological supply shops. Always make sure that the species you are using are native to your area before allowing them into your garden. Your local garden shop or other online suppliers will be able to help you figure this out. These beetles are widely known for eating aphids, but are equally effective against mites and scales. Adults are fond of aphids, but their larvae are even more voracious, preying on a wide variety of other pests. 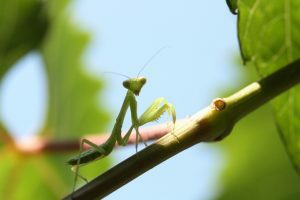 One of the most successful and effective predators in the animal kingdom, there are few pests that the praying mantis won’t eat. 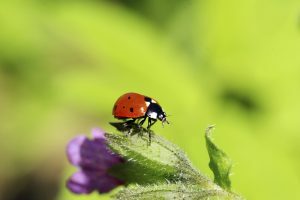 Whether you find yourself employing all of these measures, or just one, nature has its own means of dealing with chewing caterpillars, weevils, aphids and other garden pests. By relying on these natural methods, you will always have access to inexpensive, organic alternatives to artificial poisons. Eric Lancaster is Executive Vice President of TeraGanix, Inc., the exclusive North America distributor of the Original Effective Microorganisms® and EM® Bokashi products. You can visit their website at TeraGanix.com.